Sink Mark - Beaumont Technologies, Inc. Sink marks are unintended depressions on the surface of a part that do not mimic the mold steel surface. They are considered a cosmetic defect. 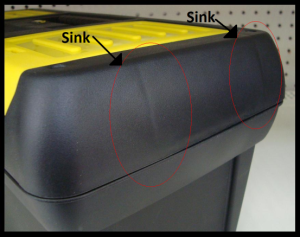 Sink marks generally result from an inability to pack out a location within the part and can result from poor process or poor part design (a part having thin and thick regions where the melt must flow from the restrictive thin regions to the thicker region). A sink develops similarly as a void but occurs as a surface defect rather than an internal part defect. To reduce or eliminate sink marks, packing needs to be improved either by process changes or part design changes (see description of Void for more detail).